The Power EZ 2 Boat Access / Pool Lift offers a battery powered access solution with lifting capabilities up to 28.5 stones (181 kilos). An affordable and comfortable sling style seat provides safety and security. The Power EZ 2 is easily portable for storage and/or relocation to another dock or pool area. Stainless steel construction and durable powder coat finish ensure long life and corrosion resistance. The battery operated lift allows the caregiver to be positioned beside the patient at all times while using the handset control. 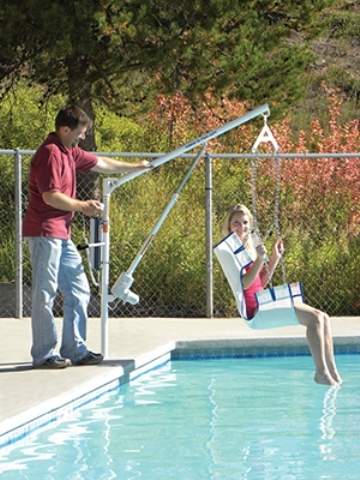 The Power EZ 2 Pool Lift truly shows the ease in the EZ lift series. Also works great as a dock to boat access lift!